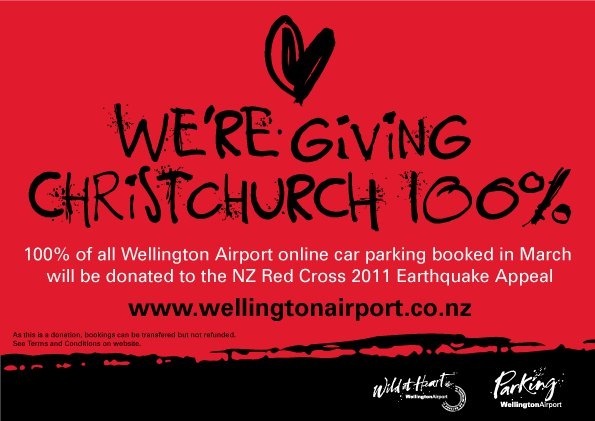 Wellington Airport will donate 100% of all online car parking proceeds during March 2011 to the NZ Red Cross 2011 Earthquake Appeal. “We have been fortunate in that we have been in a position to assist directly with facilitating the flights associated with the relief effort and the many passengers disrupted by the event. Our thoughts have been focussed on Christchurch and our entire team has expressed a desire to make a material financial contribution to support the restoration of the Garden City. In a normal month online bookings exceed $100,000 and with the level of community support for the cause March bookings could amount to a multiple of that. We hope Wellington gets behind this initiative to give Christchurch 100%,” said Steven Fitzgerald, Wellington Airport ’s CEO. Book online in March for any car park for any date up to 12 months out and the entire fee will be donated to the Red Cross appeal.